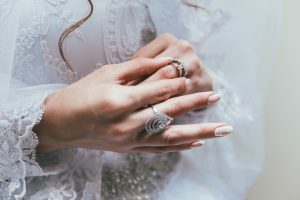 Chances are, you haven’t spent all that much time buying jewelry in your lifetime and, if you have, you’ve probably never purchased an engagement ring. After looking at various styles and stones, it’s time to work with a jeweler to actually find that dream setting. But how do you know which store to visit? (Or which online retailer to order from?) Here’s a guide to help you find the trustworthy establishment that will help you choose the right ring. 1. They have a great reputation. Check out Yelp and Google for reviews on local jewelers near you, paying particular attention to the date of these reviews and any names mentioned of any particularly helpful consultants. Or, stick with well-established stores, with a long-standing history of customer happiness! Check to see if the jeweler you want to go through is part of Jewelers of America, a group that holds jewelers to high ethical standards. 3. They carry trusted brands or feature noteworthy names. Seeing a name you can trust can really add to a jeweler’s credibility. Zales offers its Vera Wang LOVE collection, making the retailer even more reputable since a premier name in bridal has decided to partner with the store. Before you visit any jeweler, you have to have some knowledge about engagement rings—what to look for as far as quality goes and a little know-how about the way price point is determined, especially. This way, when you go into the store, you will be able to tell right away if the person you’re working with is trustworthy. 5. They treat every guest with respect. When you go to a jeweler for the first time, start browsing lower-priced items (like pendants) first to feel the store out. If the consultants at the store treat you with respect and don’t push you toward higher-priced items, you know you’ve found a good place to shop. Ideally, every customer should be viewed equally, no matter his or her budget. 6. They have a return policy. When shopping for a ring online in particular, make sure the jeweler offers returns (usually within 30-60 days). Since you won’t be able to see or feel the ring, this is critical in case you’re not happy with the purchase for any reason. 7. They have the right equipment. In order to see all imperfections in a diamond, every jeweler should have a 10x loupe through which you can see each gem up close. 8. They offer a warranty, upgrade program or other additional coverage. Stick with a jeweler who offers you a warranty or other protection on your purchase. In some cases local jewelers will allow you to upgrade a diamond! Many local jewelers offer jewelry insurance so if your diamond is chipped, broken, or lost from its original setting you will be covered. 9. They don’t pressure you into making a decision right away. A pushy consultant can really ruin your ring buying experiences—you shouldn’t feel cornered into buying the first ring you ask about. When you visit a trustworthy establishment, you’ll feel free to take your time and browse for as long as you need—and you won’t be pressured into leaving the store with a ring that day.